Studio reps love 4K UHD content as much as we do. Recently, standards for television displays have been moving goalposts. Innovation in TV tech and the standards that regulate it are rarely in sync, and that can be problematic for the consumer. Overeager manufacturers launch flashy features that don't work with the standards that eventually coalesce. End result? A TV that's an island unto itself, without any broader industry support. 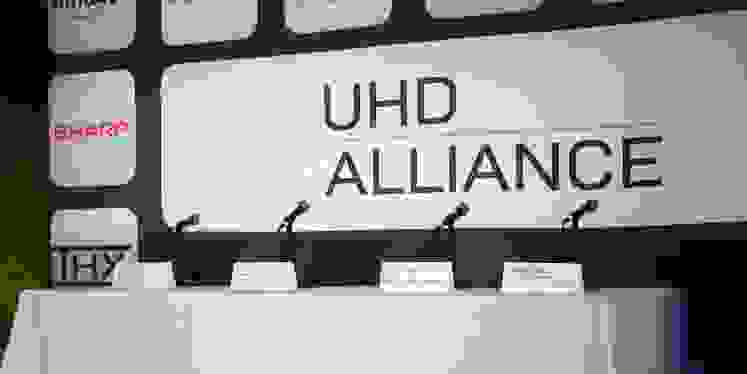 In an effort to bring order to chaos, major industry players—from content producers, to content distributors, to consumer electronics manufacturers—formed the UHD Alliance. It's goal is simple: To set standards for ultra-high definition (UHD) content and electronics. • Ron Sanders, the president of worldwide home entertainment distribution for Warner Bros.
Hanno Basse, who does double duty as the President of the UHDA and the Chief Technical Officer for Twentieth Century Fox, opened the press conference by revealing the UHD standards that the UHDA has settled on for the three types of companies that deal with UHD content: electronics manufacturers, content distributors, and content creators. Basse also introduced a licensing program for UHD. It's pretty simple: Display manufacturers can send their display to a testing facility, and if it meets or exceeds the “Device” criteria, it receives UHD certification. The manufacturer can then stamp the UHD logo on the product to emphasize its pedigree. Here's the nitty gritty: If a TV proves that it can display 4K content, more than 90% of the colors in the P3 color diagram, and either very deep blacks and moderate peak brightness, or moderately dark blacks and very high peak brightness, then it gets the UHD stamp of approval. The either-or in that equation exists to cater to both OLED and LCD displays. OLED screens can more easily achieve very dark black levels, since they can completely turn individual pixels off. Full-array LCD/LED displays, on the other hand, can more easily pump out incredible brightness. It soon became clear that there are two driving forces behind the new UHD standard. The first is the desire to give the consumer a fantastic viewing experience. Based on consumer testing, the improvement in picture quality from existing Blu-ray content to 4K UHD content with High Dynamic Range (HDR) is “a full step in consumer experience,” according to Fox's Mike Dunn. UHD is described as “a full step” in content and display evolution because it incorporates advancements made in multiple categories—peak brightness, black levels, and color range—on top of the resolution boost that 4K provides. When asked which advancement was the most important, the panel was unanimous in its pick: all of them. The biggest obstacle to the wholesale adoption of the UHD standard? Consumer and retailer education. “I think we have to be very careful not to confuse the consumer,” Singh said. “We have to, as an industry, both on the hardware and on the development side, really be very, very consistent in our messaging." “I think we have to be very careful not to confuse the consumer." Not only do the retailers have to know how to optimize the viewing experience in-store, but they also have to educate their employees about the new standards and the significance of the UHD logo. Companies and manufacturers learned this lesson the hard way. “We didn’t do as good a job when we moved to Blu-ray,” Singh confessed. The panel members expect that the adoption of UHD will happen more or less simultaneously across streaming, digital broadcasts, and physical media. In fact, some UHD titles have already been released and studios are planning to release more in conjunction with the launch of 4K UHD Blu-ray players, which should arrive as early as this spring. Production should really ramp up late in Q4, when the winter holidays come a knockin’. Basse indicated that in the future the UHDA hopes to “broaden the scope” by pushing UHD standard adoption to broadcast and mobile. The UHDA already has some broadcast partners, including Netflix, DIRECTV, and Amazon. The UHDA hopes to “broaden the scope” by pushing into broadcast and mobile. He also pointed out that image quality can only be improved so much. Because of how the human eye perceives light and images, there's a natural limit to display and image recording technology. At some point, another doubling of resolution or another billion colors won't be distinguishable to viewers. Until then, the UHDA will push for the adoption of standards that will bring the viewing experience as close to the original artistic vision—and to real life—as possible.